On the B string 1st fret and 3rd and also on the E string 1st fret. I think this would be a typo? Because notes are supposed to be laid out from A-F consecutively on the 1st to 3rd fret of the guitar. And based on the image above it doest not follow it. You are correct. The notes on the diagram are wrong - should be as you stated. First fret on the G string is also wrong: It's G#, not C#. @DavidBowling mentioned another error too - I didn't look through it all carefully now. We don't give specific recommendation here, but Music theory for Dummies is generally considered a pretty good book. I have it and I've found it to be helpful on certain points. It takes a logical, well thought out approach from the ground up, it's quite comprehensive and the content seems accurate, although I haven't diligently read it from cover to cover. What often happens is that the people making the diagrams are not the people writing the book, so the diagram isn't necessarily a reflection on the book at large. It might just mean that the editor didn't check the diagrams carefully or didn't know all the technicalities of the subject matter. You should also be cognizant of the fact that a guitar method book and a general theory book are two different things. How to play a particular instrument correctly is different than learning music theory. There are some very good players who don't know much at all about theory, and vice-versa: Excellent theoreticians who aren't very good players at all. I've found that a pretty good way to get an idea of book's quality is to look for popular books on Amazon - they will generally have any number of reviews from people who have used the book, detailing its strengths and weaknesses, its target audience, etc. Spend some time going through the reviews - the good one and the bad ones. You can often preview a book online too - look at things like the introduction, table of contents and index to get and idea of whether or not a book is for you. A poorly indexed book, or one that has poorly written intro is often a tip-off that the book isn't very good. One thing is for sure: "Don't judge a book by its cover"Ignore the fantastic claims on the cover: These Three Licks Will Make You a Guitar God!... Sight-Reading Like a Pro in 3 Days!... and evaluate the book by its contents and its reviews. 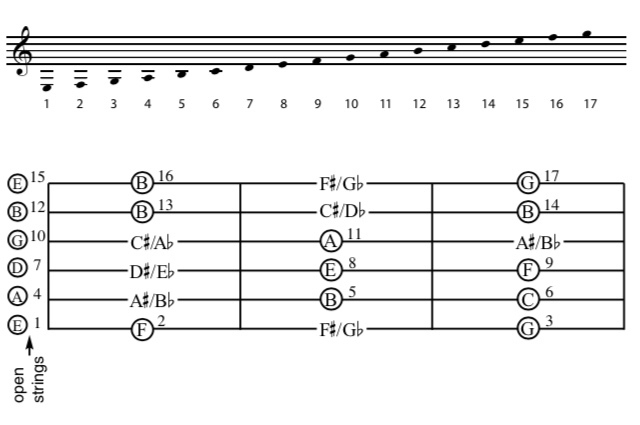 I've come across a specific method to make it easier to learn the notes on a guitar fretboard by first learning the notes on all six strings at the fifth and twelfth frets (same as open), and then referencing the location of the other notes on the individual strings relative to the fifth and twelfth fret. This is a system recommended by Ted Greene, a highly respected teacher and author of guitar studies in the U.S.
Not the answer you're looking for? Browse other questions tagged guitar key fretboard or ask your own question. which software has sorting capabilities to help mastering the fretboard?